Little time to learn Python? 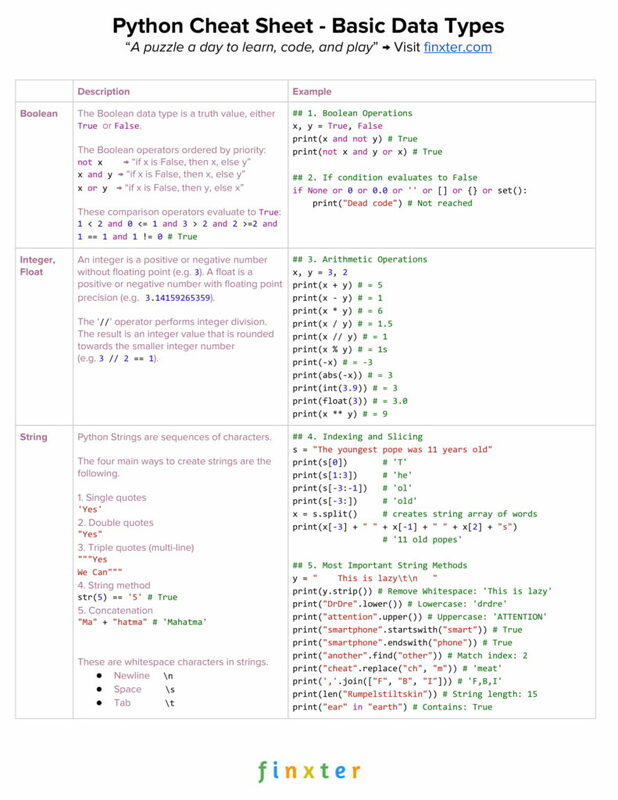 This article shows you the 5 most amazing Python cheat sheets. Download them, print them, and post them to your wall — and watch your Python skills grow! You want the most dense cheat sheet in Python? Check out this cheat sheet! You want the most comprehensive cheat sheet course? Check out this cheat sheet course! Cheat sheets are among the most efficient ways to acquire knowledge. A great cheat sheet focuses on the key learning material and skips all the rest. Thus, cheat sheets are the 80/20 principle applied to any topic you want to learn. Get 80% of the outcome in 20% of the time. So without too much unnecessary words, let’s dive into the 5 cheat sheets recommended by us. This awesome 2-page cheat sheet is maximally condensed. It uses every inch to deliver valuable information. We highly recommend this cheat sheet! Some might find this cheat sheet a bit lengthy. How True! With 26 pages, it is one of the most comprehensive cheat sheets out there. It explains variables, data structures, exceptions, and classes – to name just a few. This is the most systematic cheat sheet in our collection. One of the big trends in Python is data science and machine learning. This cheat sheet reflects this trend. It has a strong focus on data science, especially the numpy library. You will find the very basics of Python and the numpy library, plus the most important numpy functions. If you are using Python mainly for data science, download this sheet. This is just another cheat sheet which contains class methods, string methods, list methods, and slices. There are also a few not so popular functions such as system calls. This cheat sheet is for readers that want to dig deeper into more specialized cheat sheets on the cheatography site. You want to learn Python well, but you have only limited time? This course is for you. It provides 5 carefully designed PDF cheat sheets. Each cheat sheet leads you one step further into the rabbit hole. You will learn practical Python concepts from the hand-picked examples and code snippets. The topics include basic keywords, simple and complex data types, crucial string and list methods, and powerful Python one-liners. If you lead a busy life but do not want to compromise on quality, check out this free cheat sheet course!